Specially formulated, liquid, heavy-duty hand cleaner that puts dirt down for the count. Has tiny plastic, non-irritating scrubbing beads that dig deep to cut through dirt, grease and grime. Contains no solvents to dry, crack, whiten or harm sensitive skin. To use: Simply wet hands, apply UpperCutt and work into a lather, then rinse. Rich lather cleans hands thoroughly, gently and rinses away easily, leaving no soap film. Pleasant fragrance. 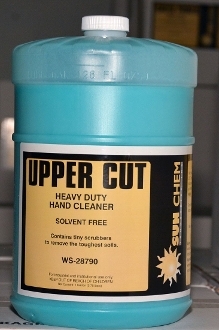 UpperCutt is the number 1 decision for mechanics, printers, painters, and factory and industrial workers. • This product contains poly scrubbing beads that dig down to remove the toughest dirt, grease and grime. Will not clog drains. Poly bead will float out of drains. • UpperCutt Hand Cleaner contains no solvents to dry out or irritate hands, which makes it a great all-weather formula. • This product produces rich later but rinses freely without leaving soap film on hands. Recommended one gallon flat top dispenser Ws-61128.